"Hands Up For Your Colors"
Tuesday, October 16 - "Coat of Many Colors"
Wednesday, October 17 - "College Colors Game Day"
Thursday, October 18 - "Colors of the Past"
Friday, October 19 - "Hands Up For Your Colors"
Dress Up Day - "Coat of Many Colors" - Joseph, King David or a Roman Soldier - Dressed as a Bible character, you will look much older! Volleyball at 5:30 & 6:30 p.m. Dress Up Day - "College Colors Game Day" - Maroon, Orange or Green - who know what college colors will be seen? Senior King and Queen Homecoming Court candidates will share in chapel. Powder Puff Football Tournament - High School Girls Football Tournament from 1-3:15 p.m. Dress Up Day - "Colors of the Past" - Fonzie, Disco or Hammer Time - Pick a decade and you'll be fine! Volleyball at 5 & 6 p.m. Dress Up Day - "Hands Up For Your Colors" - Wear Navy & White - Warrior Football is Tonight! Dress-Up Days – All K-12 students are invited to participate in the dress-up days. Click on the dates above for more information about what to wear each day. Make wise choices with your costumes so they are school appropriate. No tank tops or short shorts. If leggings are worn, shorts must be worn over them. Boys may not wear female attire. The school administration reserves the right to ask students to change clothes if it is determined that the costume is not appropriate. Homecoming t-shirts are available in two styles this year. The front will feature a small logo in navy and the back will feature a large "Hands Up For Your Colors" logo in a combination of navy, medium blue and Columbia blue (shown above). Deadline to order is Friday, October 12. Shirts must be pre-ordered and will not be on sale in the Warrior Warehouse. Click here to support your CCS Warriors! Elementary students dismissed from pep rally for carpool at 11 a.m. Secondary students dismissed from pep rally for carpool at 11:30 a.m. Welcome Home Alumni! Campus tour available from 6-6:30 p.m. Graduates will enjoy catching up in the special alumni section near the entrance to the stadium. 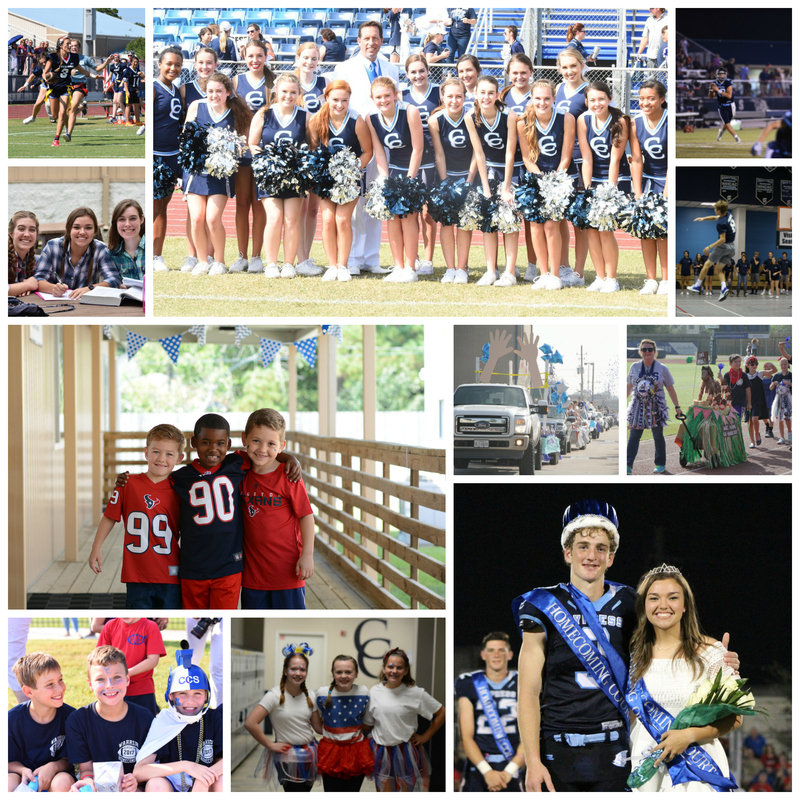 Fun homecoming news and pictures will be broadcast on the CCS Facebook, Instagram and Twitter sites. For additional information/questions, email Sandra Boyd.